Activists of the Muttahida Qaumi Movement light candles for the victims of an attack by Taliban gunmen on a school in Peshawar, Pakistan, on Tuesday. Taliban insurgents killed at least 141 people, almost all of them children. Pakistan has sustained among the most deaths from terrorism of any country in recent years, and Tuesday’s mass murder killed more civilians than any other terrorist incident in Pakistan’s history, according to media reports. Before the attack on the Army Public School, the grim security situation in Pakistan had improved slightly this year. December was on pace for the fewest civilian deaths from terrorism in a month since August 2007. More than 3,000 Pakistani civilians died in terrorist attacks in both 2012 and 2013, according to the South Asia Terrorism Portal, which monitors violence in the region. This year, through Sunday, 1,595 civilians had died, including 26 this month. Twenty-six is a horrific total for most countries in a year — 20 more than the number killed in all of 2013 in the U.S., which has roughly 75 percent more residents than Pakistan. But it’s also a monthly rate of about 58 civilians, the fewest killed in a month in Pakistan since 56 civilians died in August 2007. Tuesday’s attack reversed that modest progress; December now is the deadliest month since February. These figures, like all terrorism death counts, aren’t exact. Researchers, often relying on incomplete or conflicting media reports, don’t always agree on how many people died and which people were civilians, as opposed to security forces or terrorists or insurgents. “Figures are compiled from news reports and are provisional,” the South Asia Terrorism Portal cautions on its website. For example, the portal’s numbers differ from those compiled by the Institute for Economics and Peace for its Global Terrorism Index, which last month ranked Pakistan as the country with the third highest terrorist activity in the world, behind Iraq and Afghanistan. The institute uses data from the National Consortium for the Study of Terrorism and Responses to Terrorism, which is based at the University of Maryland, College Park. The consortium uses software to mine news articles and add events to its database. 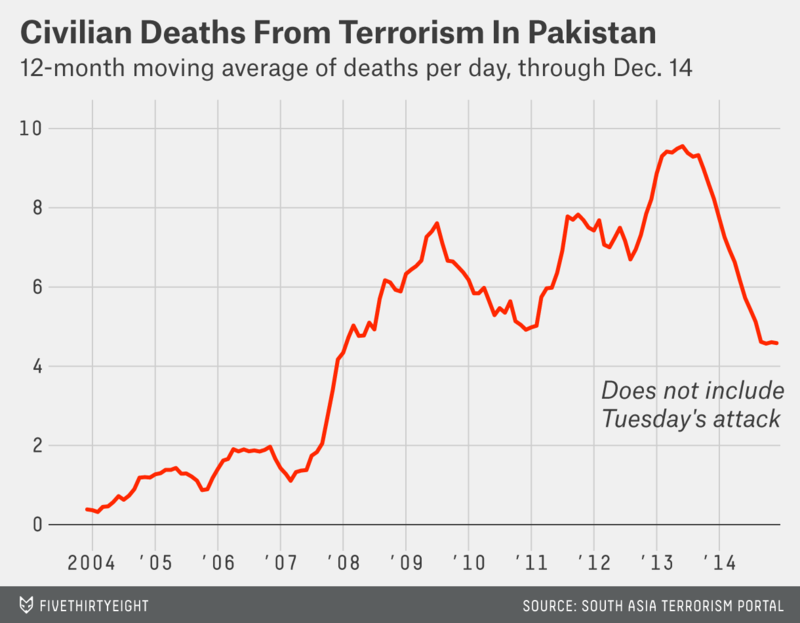 It counted 2,345 people killed by terrorism in Pakistan last year. The two sources agree on the long-term trend: that the number of civilians killed annually had increased roughly 20-fold in Pakistan from 2003 to 2013. Peshawar’s province, Khyber Pakhtunkhwa, had been experiencing relative calm until Tuesday (like Pakistan overall). Terrorists killed five civilians in Khyber Pakhtunkhwa last month, the fewest there since August 2013. The region was on pace to reduce civilian terrorist deaths this year by roughly 50 percent from last year’s total of 603.